Hurray, it’s time for the continuation of the Pattern Magic series! Back in 2013 I wanted to make one pattern from the Pattern Magic books each month, but got stranded after month 5. We were preparing for our big trip, I was working during the day and drafting the Jade in the evenings, and there just wasn’t any time left. I am excited to get started again, I have found more Pattern Magic sources and I intend to use them all! 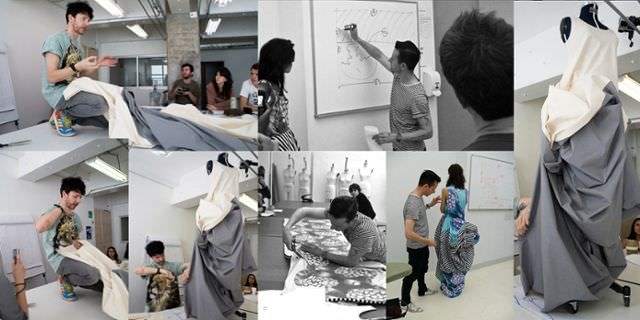 Studio Farò is a fashion design and pattern making studio based in Sydney, Australia. They have a fun thing on Facebook where they post a pattern puzzle every Saturday. They show one or more pattern piece(s) without any markings, and you have to guess what it is. Afterwards they show how to adapt a basic sloper to make the garment. They have several designs I’d love to make, below are a few simple ones. What I love about these is that they could easily fit into your daily wardrobe. If you find the Pattern Magic books too daunting, I’d start with one of these. Check these three creations made with Studio Farò’s designs from Sally, Julia and Eve. It’s a very interesting concept and I’d love to experiment with the examples he gives. I’m not sure on what scale yet, whacky or wearable. It could be very liberating to do it full scale and not care about wearability. And then of course the Pattern Magic books – there is a lot more to discover in there. I’ve only gone through the first book and there are two more, one for woven and one for knits. I’ve created a board on Pinterest to gather inspiration and I’ll be using the #patternmagic on Twitter and Instagram. If you want to join me, use the hashtag or @paprikapatterns so I can round them up and everyone can admire your creations! Thank you for reminding me about Studio Farò, Lisa! I had seen their blog before, but had lost the link. I’ve just added the blog to my feed reader so that won’t happen again! I’m excited to see what you’ll come up with first! I’ve also wanted to play with the Pattern Magic books, so perhaps I’ll manage to join you. I already have an idea for a first, reasonably simple adjustment to another pattern that would be fun to try. Great, I’d love to see what your first experiment will be! oh, I love both studio faro and the substraction cutting. I really need to set some time apart to do more of this experiments myself. So good you are starting these series again! Can’t wait to see what you’ll come up with!